A compilation of demonstrations and evictions in the 1st 4 months after Hurricane Katrina. Also, we hear from Katrina Evacuees in New York City about the ordeal and injustice involved in navigating the governments system of relief. In November right after Hurricane Katrina I went on a walk in the 9th ward with some volunteer animal rescue workers. John Lewis speaks at the 40th Anniversary of the murder of 4 students by the US Government at Kent State University. James "Guin" McGuinness discuses the realty of Jail Time for Non Violent Civil Disobedience actions to bring attention to the environmental cost of Mountain Top Removal. Four people protesting Massey Energy's mountaintop removal mining practices were arrested Wednesday after linking their arms together with plastic pipe and duct tape, briefly blocking a private road to Massey's Boone County headquarters.The Boone County sheriff charged the four men, who range in age from 22 to 80, with trespassing, destruction of property, failure to obey lawful command, conspiracy and resisting arrest. The sheriff says the makeshift roadblock nearly caused an accident as cars backed up to nearby US 119 in heavy fog. Standup. One of those charged was 80-year-old Roland Micklem, 80, of Savannah, N.Y. Deputies also busted Joseph Hamsher; James McGuinness, and Fred Williamson. 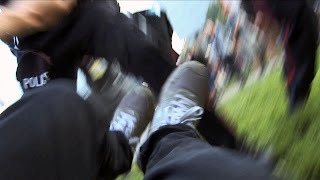 A fifth person detained and charged after the protest was described by Climate Ground Zero as an independent videojournalist who goes by the name FluxRostrum. Cops called him Gianni Lapis and charged him with trespassing, conspiracy and failure to obey a lawful command. The latest protest comes just two days after a huge pro-coal rally that Massey helped sponsor. wanna buy me a beer? Freeze Flash Mob & Police Brutality - Don't Buy War! Occupy Portland Undercover Cops at meeting .9.30.11.